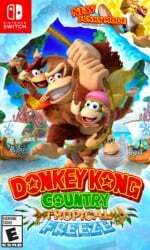 Donkey Kong Country: Tropical Freeze was one of the Wii U's gaming highlights; the platforming fun was great from start to finish, but it also looked great and played nicely, too. To explore the differences between the WIi U version and the upcoming Switch version, though, and to check for any improvements, the folk at Digital Foundry have been putting the game through some hefty tests. The video shows that the Switch version is a more polished experience than the game's first outing, with the Wii U's native 720p resolution being boosted to 1080p when docked on Nintendo's latest hardware. The game's textures appear sharper on Switch, with smaller details being allowed to shine just that little bit more than before. When playing in portable mode, Digital Foundry found the resolution to sit in the area of 1152x648. Perhaps of greater consequence, however, is the confirmation of a solid 60fps being present with no drops in sight. As always, players may have slightly different experiences as they play through the game, but this analysis saw the framerate stay true in both docked and portable modes. Fantastic stuff. Will you be grabbing the game on Switch when it launches next week? Digital Foundry should do a video on LABO. Comparing the thickness and strength of LABO's cardboard to Amazon's delivery boxes. Ehhhhh, I don't know... I'm more excited for the new bowser's inside story + Bowser jr.'s journey game, than I am for this... So I proabably wont get it. So it doesn't even hit 720p undocked? That's surprising. Disappointing, too. Somehow I did skip this on the wii u. Great game, but I am not going to double-dip on this one. I highly recommend it to those who haven’t played it, though! I own it on the Wii U and I still need to actually play it. I might buy it on sale because my wife loves dkc and I doubt she'd want to pay with the bulky gamepad. I just don't really want to pay full price for a game I already have. Good to know it runs well though. A must have, i hope Nintendo will make a Donkey Kong Vs Mario game in the future. I would only ever pick this up on a sale. But not dropping below 60 should be the priority for all video game developers. This looked stunning on Wii U, I hope anyone getting to play it now for the first time loves it as much as I did, a masterpiece. Another improvement worth mentioning is the load times, which were probably the only bad thing about Tropical Freeze. Much faster now. I hope this game gets the love it deserves this time round. Already beat this game on the U and pre-ordered the digital download for the Switch. This makes me wish they'd do DKC Returns as well. I much preferred the traditional controls on the 3DS port, but obviously it took quite a hit visually. Can't remember the last time it used my Switch so certainly looking forward to this one. I have the Wii U game, and I gotta say, the load times are a good bit longer than I'd come to expect from Nintendo, but the game is magnificent. I really hope people give it a proper welcome on Switch. @Nincompoop speaking of Labo, boy has that thing really fallen off a cliff since it's debut. It's like it never released. Can't wait to pick this up. Will be a nice early birthday present to myself. Haven't played a Dkc game since number 2 on the snes! @gatorboi352 Dunno, I do see plenty of comments/articles about it? But I don't know how much that translated sales-wise. To be honest it may well have been one of the more "gimmicky" things to release to Switch. Wii/WiiU were decent consoles but their "gimmick" did wear itself dry after sometime(or never picked up in the first place the case of the gamepad screen of the WiiIU). Thankfully, the nature of the Switch is such that something like even a failure of Labo won't hurt it. Since it's main strength(portability with a "starting package" dock for day-one TV support) is actually one that lend itself very well for traditional gameplay. Which is why the strong third party support of the Switch hasn't been a coincidence. If you start with Motion Control as an optional thing rather than a required one.... control scheme-wise it's much easier to produce a lot of traditional game that still benefit from it's portable nature. Wii/WiiU marketed their motion control(and dual screen) so much in comparison... developers kept tripping over themselves figuring how to support that in their game in a sensible way and ultimately gave up due to the lack of reliable support for a lot of development engines anyway(another thing the Switch fixed in a major way with huge support of Unity/Unreal engines this time around, Which is why port are much easier this time around. It's not just the hardware; it's having access to the same game development engines originally used for a game that also thus make the job of optimization that much easier... because it makes optimization possible in the first place). Already got mine preloaded. The smaller file size, quicker load times, and portable play made this an easy download for me. Very cool. I'll be in line if they ever come out with a new one. @Ludovsky yeah. I feel as though Switch didn't even need Labo. It's one of those things that one team inside Nintendo really wanted to do once Switch success took off, and another team was probably like "ehhh.... ok fine. ugh." and here we are. £20 vs £60... no thanks, I think I’ll pass. Great game for newcomers but still overpriced! I’m glad they hacked Switch (even if I never going to mode mine) because that may force Nintendo and 3rd parties to cut Switch taxes for games. I wonder if they would ask full price for games like this if pirated games for Switch are already in the wild..
Wii and DS were both fully hacked and very easy to pirate for within the first year of their respective existances. This NEVER dissuaded Nintendo from charging what they usually charge for games, and they still made a colossal amount of money. So I don't think the Switch getting hacked is going to serve the player's agender in that regard, but I could be proven wrong yet. Oh I'm sure of it. I heard some pretty nasty stories. 200%'d this on Wii U. No need to buy it again for an easy mode extra. @gatorboi352 Labo released 5 days ago in the US, not out until 27th in the UK. Number 1 & 3 in the Japanese charts. So cliff and falling is stretching it a bit, even for you. @mailman I agree. The price is ridiculous and the extra content is an abysmal. Not buying this game before it goes for half the price. Looking forward to this. Couldn't get into it on Wii U and sold my copy but keen to give it another go. £35 pre-order which is nice. There u go, DF haters. They have great things to say about a Nintendo game, for thrice. Their work is purely informative and is in no way hatership. I watch just for the technological analytical aspects. They really do great work.